, a poet and statesman of Scotland, is said to have been a descendant of the ancient family of Macdonald. 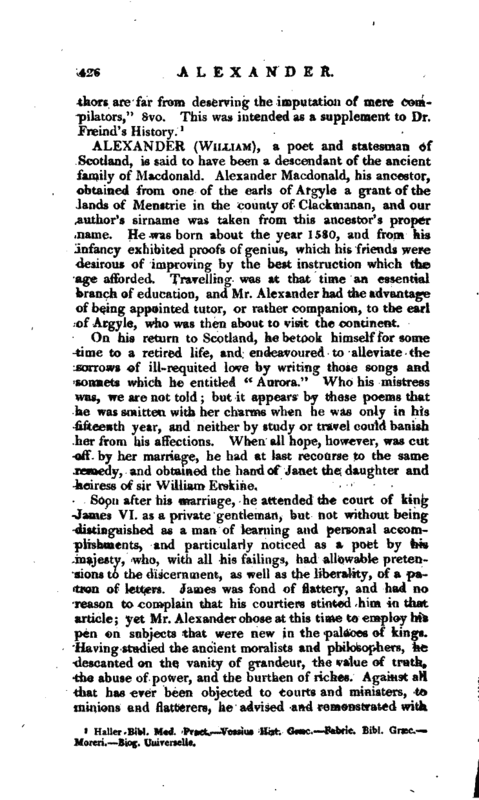 Alexander Macdonald, his ancestor, obtained from one of the earls of Argyle a grant of the lands of Menstrie in the comity of Clackmanan, and our author’s sirname was taken from this ancestor’s proper name. He was born about the year 1580, and from his infancy exhibited proofs of genius, which his friends were desirous of improving by the best instruction which the age afforded, Travelling was at that time an essential branch of education, and Mr. Alexander had the advantage of being appointed tutor, or rather companion, to the earl of Argyle, who was then about to visit the continent. 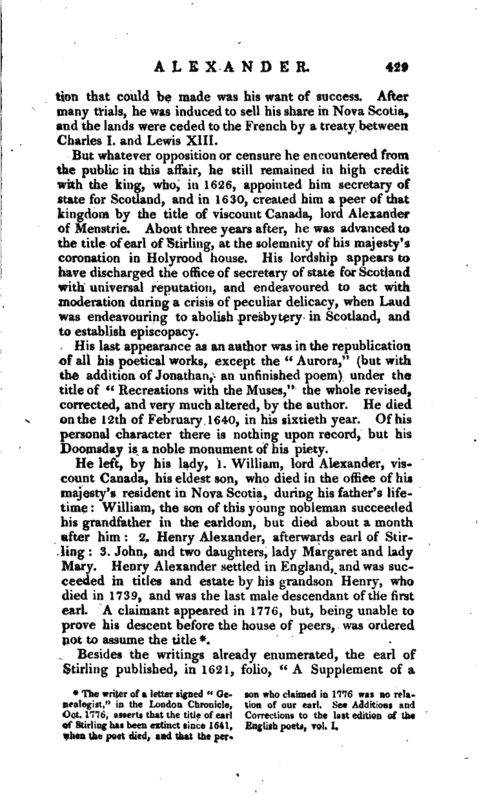 On his return to Scotland, he betook himself for some time to a retired life, and endeavoured to alleviate the sorrows of ill-requited love by writing those songs and sonnets which he entitled “Aurora.” Who his mistress was, we are not told; but it appears by these poems that he was smitten with her charms when he was only in his fifteenth year, and neither by study or travel could banish lier from his affections. When all hope, however, was cut off by her marriage, he had at last recourse to the same remedy, and obtained the hand of Janet the daughter and heiress of sir William Erskine. Soon after his marriage, he attended the court of king James VI. as a private gentleman, but not without being distinguished as a man of learning and personal accomplishments, and particularly noticed as a poet by his majesty, who, with all his failings, had allowable pretensions to the discernment, as well as the liberality, of a patron of letters. James was fond of flattery, and had no reason to complain that his courtiers stinted him in that article; yet Mr. Alexander chose at this time to employ his pen on subjects that were new in the palaces of kings. Having studied the ancient moralists and philosophers, he descanted on the vanity of grandeur, the value of truth, the abuse of power, and the burthen of riches. Against a11 that has ever been objected to courts and ministers, to minions and flatterers, he advised and remonstrated with | prolix freedom in those Tragedies which he calls “Monarchic,” and which, however unfit for the stage, seem to have been written for the sole purpose of teaching sovereigns how to rule, if they would render their subjects happy and loyal, and their reigns prosperous and peaceful. 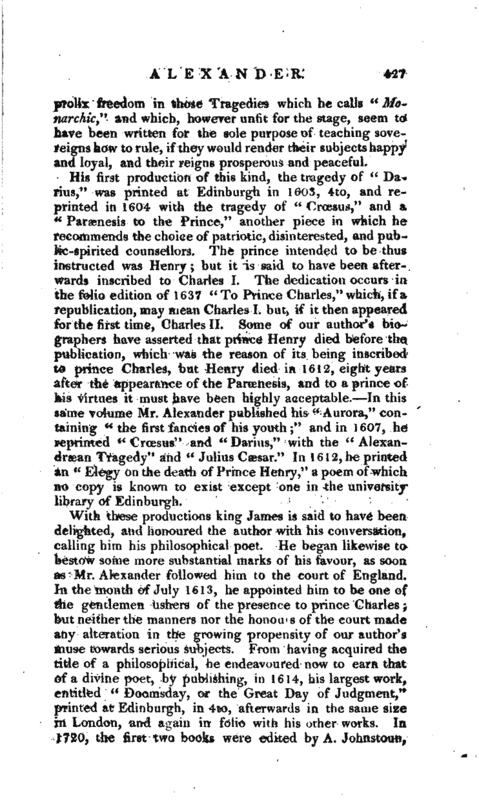 His first production of this kind, the tragedy of “Darius,” was printed at Edinburgh in 1603, 4to, and reprinted in 1604 with the tragedy of “Croesus,” and a. “Parsenesis to the Prince,” another piece in which he recommends the choice of patriotic, disinterested, and public-spirited counsellors. The prince intended to be thus instructed was Henry; but it is said to have been afterwards inscribed to Charles I. The dedication occurs in the folio edition of 1637 “To Prince Charles,” which, if a republication, may mean Charles I. but, if it then appeared for the first time, Charles II. Some of our author’s biographers have asserted that prince Henry died before the publication, which was the reason of its being inscribed to prince Charles, but Henry died in 1612, eight years after the appearance of the Paraenesis, and to a prince of his virtues it must have been highly acceptable. In this same volume Mr. Alexander published his “Aurora,” containing “the first fancies of his youth;” and in 1607, he reprinted “Croesus” and “Darius,” with the “Alexandraean Tragedy” and “Julius Caesar.” In 1612, he printed an “Elegy on the death of Prince Henry,” a poem of which no copy is known to exist except one in the university library of Edinburgh. With these productions king James is said to have been delighted, and honoured the. author with his conversation, calling him his philosophical poet. He began likewise to bestow some more substantial marks of his favour, as soon as Mr. Alexander followed him to the court of England. In the month of July 1613, he appointed him to be one of the gentlemen ushers of the presence to prince Charles; but neither the manners nor the honou s of the court made any alteration in the growing propensity of our author’s muse towards serious subjects. From having acquired the title of a philosophical, he endeavoured now to earn that pf a divine poet, by publishing, in 1614, his largest work, entitled “Doomsday, or the Great Day of Judgment,” printed at Edinburgh, in 4to, afterwards in the same size in London, and aoain in folio with his other works. In 1720, the first two books were edited by A. Johnstoun, | encouraged by the favourable opinion of Addison who, however, did not live to see the edition published. King Charles appears to have been fully persuaded of the excellence and value of the project, and rewarded sir William Alexander by making him lieutenant of New Scotland, and at the same time founded the order of knights baronet in Scotland. Each of these baronets was to have a liberal portion of land allotted to him in Nova Scotia, and their number was not to exceed one hundred and fifty; their titles to be hereditary, with other privileges of precedence, &c. Sir William had also a peculiar privilege given him of coining small copper money, which occasioned much popular clamour, and upon the whole the scheme does not appear to have added much to his repur tation with the public, although perhaps the worst | objection that could be made was his want of success. 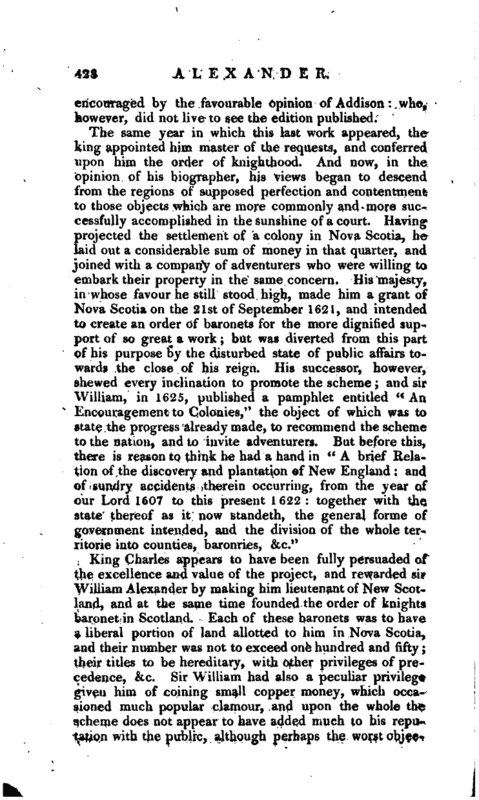 After many trials, he was induced to sell his share in Nova Scotia, and the lands were ceded to the French by a treaty between Charles I. and Lewis XIII. But whatever opposition or censure he encountered from the public in this affair, he still remained in high credit with the king, who, in 1626, appointed him secretary of state for Scotland, and in 1630, created him a peer of that kingdom by the title of viscount Canada, lord Alexander pf Menstrie. About three years after, he was advanced to the title of earl of Stirling, at the solemnity of his majesty’s coronation in Holyrood house. His lordship appears to have discharged the office of secretary of state for Scotland with universal reputation, and endeavoured to act with moderation during a crisis of peculiar delicacy, when Laud was endeavouring to abolish presbytery in Scotland, and to establish episcopacy. His last appearance as an author was in the republication of all his poetical works, except the “Aurora,” (but with the addition of Jonathan, an unfinished poem) under the title of “Recreations with the Muses,” the whole revised, corrected, and very much altered, by the author. He died on the 12th of February 1640, in his sixtieth year. Of hispersonal character there is nothing upon record, but his Doomsday is a noble monument of his piety. The writer of a letter signed “Genealogist,” in the London Chronicle, Oct. 1776, asserts that the title of earl of Stirling has been extinct since 1641, when the poet died, and that the per­ son who claimed in 1776 was no relation of our earl. Ses Additions and Corrections to the last edition of the English poets, vol. I. Besides the writings already enumerated, the earl of Stirling published, in 1621, folio, “A Supplement of a | defect in the third part of Sidney’s Arcadia,” printed, according to Mr. Park, at Dublin; and “A Map and Description of New England, with a Discourse of Plantation and the Colon es, &c.” Lond. 1630, 4to. 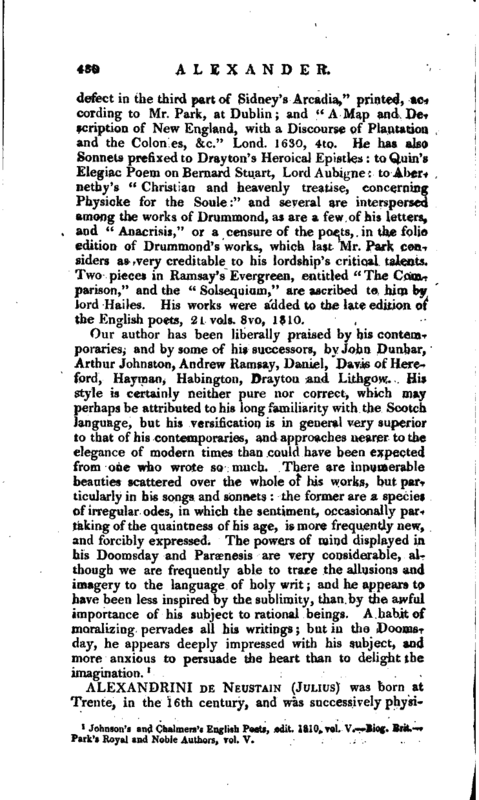 He has also Sonnets prefixed to Dray ton’s Heroical Epistles to Quin’s Elegiac Poem on Bernard Stuart, Lord Anbume to Abernethy’s “Christian and heavenly treatise, concerning Physicke for the Soule:” and several are interspersed among the works of Drummond, as are a few of his letters, and “Anacrisis,” or a censure of the poets, in the folio edition of Drummond’s works, which last Mr. Park considers as very creditable to his lordship’s critical talents. Two pieces in Ramsay’s Evergreen, entitled “The Comparison,” and the “Solsequium,” are ascribed to him by lord Hailes. His works were added to the late edition of the English poets, 21 vols. 8vo, 1810. Johnson’s and Chalmers’s English Poets, edit. 1810, vol. V.—Biog. Brit.— Park’s Royal and Noble Authors, vol. V.